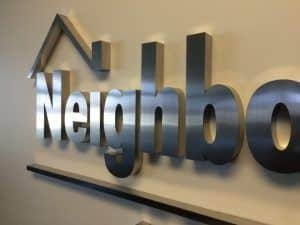 When NeighborWorks America was opening an office in Los Angeles, they were looking for a local sign company to make their lobby sign. They found us online and reached out to us with some existing sign specifications to give us an idea of what type of sign they wanted. 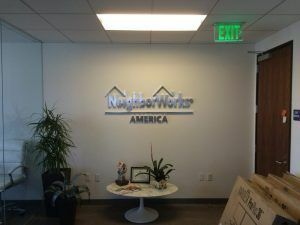 NeighborWorks America’s headquarters is in Washington D.C., and they have multiple offices throughout the United States. Other offices of theirs already had an interior sign, and they wanted the same style of sign for the Los Angeles office. As you can see from the photos, we made a sign of their logo from metal letters. These are not dimensional letters but fabricated metal letters or channel letters so the inside is hollow. The client specifically requested fabricated stainless steel letters with brushed stainless faces that are 1″ deep. The size of one of the existing signs was perfect for the Los Angeles location so we made the sign according to their exact dimensions. 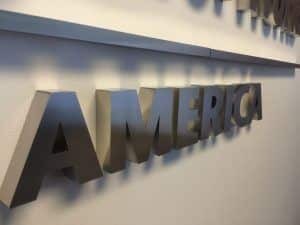 There are two main styles of channel letters; front-lit where the faces are translucent so they light up, and reverse-lit where the letters are solid and the back is clear so the light reflects on the wall or backer panel. This sign is not meant to be illuminated, but the entire thing was to be metal so we made them a set of non-illuminated reverse channel letters. The faces were routed, and the returns of each letter and each component of the logo were bent and welded to the faces. We would normally put a clear back on reverse-lit channel letters and mount the sign with spacers so the lighting source has room to illuminate. However, since this sign didn’t need to light up, we didn’t include backs, and the letters were simply stud mounted flush to the wall.